1. Winter tires – $200 х 6 wheels. Every 125,000 miles. 2. Motor oil, 30 liters – $150. Every 15,000 miles. 3. The fifth wheel repair, 5 standard hours x $25. Overdue: needed yesterday. Can a fleet owner stay sane given how many numbers they should keep in mind? 1. They visit the service station less often due to proper driver behavior monitoring. We talked about it some time ago, in the article on Eco Driving. 2. They have Fleetrun, the new solution by GoGPS that helps to plan and control the maintenance process and not get lost in numbers. When is the right time for maintenance? How much do the work and the spare parts cost? Today, the owners of the top level accounts will find Fleetrun in Apps menu. If you don’t see Fleetrun among the web applications by GoGPS, can’t access it through apps.wialon.com or on the direct link, contact your monitoring service provider. And now let’s dive into the details. After authorization, you will probably experience “deja vu” because we took the structure and work logic from NimBus. Same as our solution for public transportation control, Fleetrun has two interfaces: administration and control. Here you will meet the term “Fleet” for the first time. It is your client – you control the technical state of all vehicles added to Fleet. 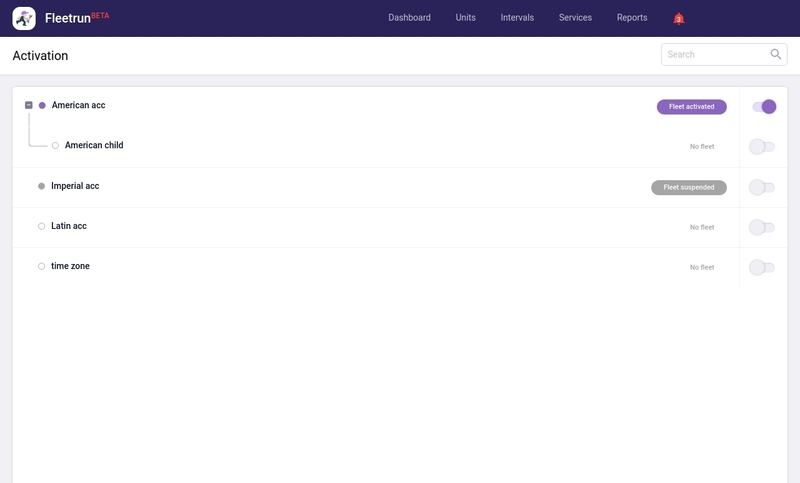 To start working, activate Fleet for your or the lower-level accounts just like you do with “Depot” in NimBus. Monitor the maintenance process through notifications and manage messages sent to third-party servers. Got the management tool – ☑ Yes. Time to proceed to control. Right now, GoGPS maintenance module is actively used to control 110,000 vehicles. To cover other 1,6 mln units, we included the extended functionality in Fleetrun to plan the entire process, keep expenditure record, and manage maintenance intervals. Well, that are the new options you, as an integrator, can offer the fleet owner. The number of vehicles that operate and those idling at the service station. The former make the profit while the latter pump out the money. Due, in progress, and overdue services. Plan your work taking into account how many vehicles will be unavailable in the short run, and the risk of critical breakdowns in the vehicles that missed the repair or maintenance. The fleet maintenance cost. View it in progress and consider mileage or engine hours. Is there any correlation? Or vehicles get broken not even leaving the fleet yard? To find time to carry out dozens of overdue services. The “Cost per 1 km” parameter will show the most expensive vehicles in terms of maintenance. The location on the map will show if the unit is actually at the right service station. The unit profile will display the vehicle detailed description when you work with the units list. By default, service is a set of works on vehicle maintenance. Looking through the Service assigned to a Fleetrun unit, the fleet manager sees what is to be done, when and what spare parts should be used, how much it costs, and what is the expected result. When the Service is assigned to the unit, this set of works is registered in the system. Let’s say, we have the “Oil change” Service scheduled for December 14. We set up Fleetrun in such a way that on December 12, Service is assigned to the specified unit and gets to the “Due” Services so we could have enough time to plan it out. When the fleet manager sees a new Service, they understand that the vehicle will undergo the oil change in two days. They need to call the service station, sign up the vehicle, and let the driver know. The driver calls the fleet manager to inform them everything is done. The manager changes the status into “Closed.” The “Oil change” Service that costs $50 gets into the archive to be displayed later in reports and statistics. Let’s compare the process with something familiar. The Service assignment in Fleetrun is like the registration of works in the fleet manager’s register. The manager doesn’t breath down the mechanic’s neck, they just call to make sure: the vehicle is at the service station, the mechanic follows the work plan and uses the right spare parts. In the end, the manager gets to know the result: mechanic examines the vehicle and either gets the job done and issues an invoice or says the repair is not needed, in other words – rejects the Service. One more important option: you can attach a file to the Service. For example, a mechanic or driver sends you the picture from the service station or document scans, you attach them to the Service for this vehicle and can view them at any time. You can create the Service manually or set up an automated activation with the help of Intervals. by engine hours – in 250 engine hours the app will notify of the “Maintenance” service for the tower crane. Besides, you can set up all these three conditions to make Fleetrun create the service upon the happening of the first one. You have the Interval, a versatile template with the set of works tailored to your fleet. It is tried and tested. When the Interval says it’s time, the service with the set of works and spare parts is automatically created and assigned to your vehicles. Even if not all vehicles need this set of works or other spare parts should be used, it is always easier to change the already existing Service than create a new one. When the Services are assigned, you can deal with the set of works for each vehicle: edit, delete unnecessary ones, add another description (TAPERED ROLLER BEARING!!!). It will help to avoid the errors, save time, and automate the creation of Services in large fleets. Spare parts and services cost money. All expenditures can be saved in the “Library” to be used later at services and intervals creation. You can also edit them and create new ones based on the already existing ones. If you know that one wheel changing on a 9-ton Scania costs say $25, and the tire itself costs $300, you can save this data in the library and use it for the same trucks. Maybe you need only the cost of spare parts or services or wheels? Search and filtration fields will help you find the right element faster. With Fleetrun, you know how much you spend on maintenance and can make up a plan on how to spend less. Notifications will inform you of all the services: new and overdue, closed and rejected. You will get to know not only what happened but will also be able to go to the service itself – check it out, edit, change the status, or just make sure everything is ok. In Fleetrun, we offer preset reports without any unneeded information. We kept the parameters attributed to maintenance only: archived services, the correlation of closed, rejected, and overdue services, their total cost, etc. One click and they are exported into the Excel file. More good news: archive data on each vehicle’s all fulfilled services will be stored for 5 years. Considering the application’s advantages, they are a user-friendly interface, specific reports, convenient works and expenditure records. But on a more global scale, it is a big step for GoGPS towards FMS and process automation, a step away from multipage Excel documents and paper registers. And we offer Taking this step together. Fleetrun is one of those solutions that we plan focusing on. We want to provide GoGPS users with such a powerful solution so they could do what has to be done with GoGPS and Apps only, without the need to pay for the third-party software. 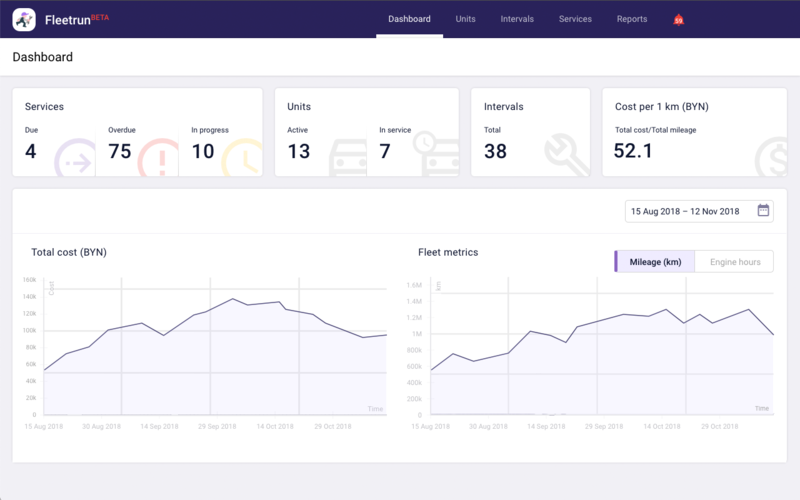 What I am getting at here… With Fleetrun you can add another service to your portfolio – fleet maintenance management. Are you already using the Wialon maintenance module? Transfer your work there to Fleetrun. Moreover, in a few clicks in administration mode, you can relocate the maintenance data from GoGPS to Fleetrun. Press this button, select intervals, and show Fleetrun to the client at the next meeting.